October half term is essentially autumn, coming with a healthy dose of muddy puddles, multi-coloured leaves and, of course, spookiness at the end of October. Although it is starting to get chilly and damp, it’s still good for getting out and about so we’ve had a look at what you can get up to while the kids are off school. 1. 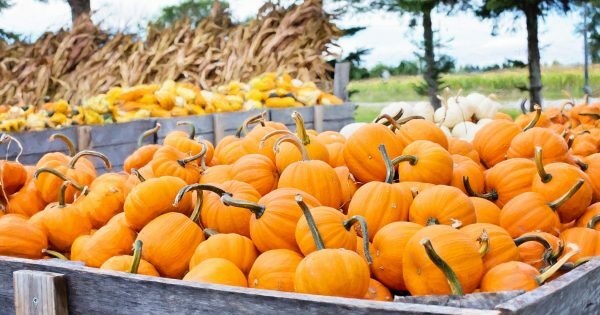 With Halloween not far away, why not go pumpkin picking? This is a fab family fun day out – gadget-free and in the fresh air – and, what’s more, you can choose exactly the right one (or ones) for your Halloween decorations. There are lots of places open now where you can pick your own pumpkin so why not give it a go? 2. If you’re in the Midlands, then a visit to Stoke Bruerne Canal Museum is a great day out. Situated on the Grand Union Canal, you can take a journey through the stories and traditions of Britain’s historic canals, including Blisworth Tunnel, where boaters used to ‘leg’ their boats through the narrow passage. For more details of what to see, please click here. 3. Perhaps you fancy a final sunny hurrah before the long, cold, dark winter sets in! If so, then check out the deals on Travel Supermarket and grab a last-minute break to the sunshine! It could be the last you’ll see of it for a while! 4. A trip to London is always a hit and a visit to the Museum of London (it’s free) will give you an unforgettable journey through the capital’s turbulent past. Discover prehistoric London, see how it changed under the Romans and Saxons, marvel at medieval London and see how the city survived civil wars, plague and fire. Pick the right day for the weather and you can rest your weary feet aboard a hop on hop off bus tour, visiting the top attractions on the way. If you’ve got a little Shrek fan in the house, then look no further than Shrek’s Adventure! London situated in County Hall and close to other top attractions including the Coca-Cola London Eye, the SEA LIFE London Aquarium and the London Dungeon. 5. Finally, a break away in Blackpool is always a favourite. Take a tram ride down the prom and see the illuminations that stretch for almost six miles! But it’s not just about the illuminations, there’s much more to do as well! For thrill seekers, there’s the Blackpool Pleasure Beach where, new for 2018, ICON has arrived – the UK’s first ever double-launch rollercoaster! Oh and how could we forget Blackpool Tower? It’s one of the most recognisable landmarks in the world playing host to the Tower Ballroom, The Tower Circus, The Blackpool Tower Dungeons and the Blackpool Tower Eye. Finally, you can meet the stars at Madame Tussauds, swim with sharks at SEA LIFE Blackpool or visit the animals at Blackpool Zoo. Is half term long enough for all of this? Have you got any plans for half term? If so, let us know over on Facebook and Twitter.